Maturing Youth from R&F Entertainment is about a middle aged low life man named Roger, played by Sean A Kaufman [Sean A. Kaufman interview - click here], who has no ambition and zero direction in life. This man's world is turned upside down with a surprise visit from his ex girlfriend, named Sadie played by Kim Paris. I don't want to give away too much about my character but I play the adult version of Roger's son Junior. The little version of me is played by child actor Joshua St. Leger [Joshua St. Leger interview - click here]. How did I turn out? You guys are just going to have to watch and see! What did you draw upon to bring your character to life? And since you play the older version of one of the leads, did you at all take his performance as a sort of template for yours? You know, I have an incredibly strong Mom, who for me was both Mom and Dad. She did what she could and I had a great upbringing because of her. I had to got back to my childhood and relive some experiences that were not so pleasant. I sat with those memories and emotions and through the magic of acting was able to create and imagine situations that led to my character's choices in life. Both good and bad. Some of those emotions you see are from real life experience. From my homie Kim Paris! She had told me some time ago that they're still casting for this new short she's in. She really saw something in me and thought I'd be good for the part. Thank God I listened to her. I got to audition and well, here we are! Thank you Kim! When you first meet Divoni, you're slightly intimidated by him. Once you get to know him he's super cool. He was very involved in scene work and supportive of all of us and our choices. The crew was really fun to work with. I spent quite a bit of time with the make up crew. It can get weird sometimes when someone is super close to your face though. It felt awkward, so I would break the ice by joking around and being silly. On set was pretty awesome. 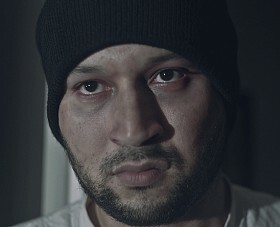 Some of my scenes called for some heavy dark moments. It was really nice to see how quickly the set and crew adjusted between scenes. I was cast in Gepetto's Strings. It's about a religious man who has some bad things happen to him and has to make tough decisions to help his family. Funny thing is I actually started with music. It was a big passion of mine. 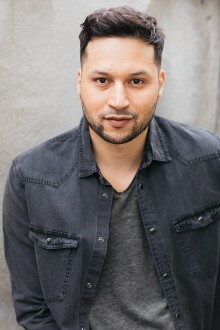 The acting bug had crept up on me at some point while I was in a music group and I decided to pursue it and start out with some acting classes. I literally googled "Free Acting Class" to see what was out there. To my surprise and what I call fate, Penny Templeton Studios was offering a free class and was located just a few doors down from me. Penny introduced me into the world of acting and I haven't looked back since! Most of my film work has consisted of shorts, commerical's and music videos. Can't wait for that big feature! I feel like I come off as a bit mysterious in nature, and I think you see a sprinkle of that in a lot of the roles I play. You always have to give your character a life prior to what ever the scene or film is about. Creating a back story to the character's life helps me create situations that would cause the character to say what he's saying, do what he's doing. Meryl Streep. Her ability to take on any role and truly give it a complete and full life is amazing and really motivates me. I love Johnny Depp, especially in all his Tim Burton films. Robert Downey is another favorite. He seems super cool to me, natural and effortless in all his roles. I really love a lot of the movies of the 80's. The Never Ending Story, Labyrinth, Beetlejuice, Gremlins! I could go on and on. Hmmm? I don't know LOL! I feel like movies I thought I hated, I ended up loving just cause they were so bad! Now you got me thinking! Maturing Youth is making its world premiere at the augural Cutting Room International Short Film Festival in New York City. 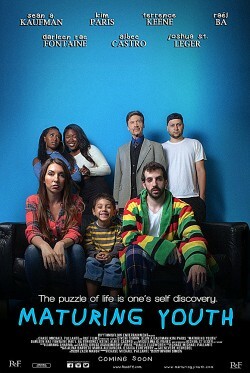 For more information and details go to www.MATURINGYOUTH.com - I can't wait for everyone to watch! All images courtesy of R&F Entertainment.